Jane Whitefield is a one-woman witness protection program and friend to those who are in trouble and need to disappear. She is a Native American woman who has the skills to “grow” fake identities and hide her runners under the radar. In her sixth book, Runner by Thomas Perry, she comes out of retirement to help a pregnant young woman who is being hunted by the abusive father of her child. The man is the son of wealthy real estate developers who will stop at nothing to become grandparents. Things don’t go as planned, however, because during the years that Jane has been trying to live a normal life, technology has made disappearing much more difficult. You can find Jane Whitefield on my list of favorite fictional characters because she is smart, tough, and unbelievably resourceful. The time and effort she puts into creating fake identities – acquiring forged documents, creating a credit history, falsifying work histories and references, etc. show her cleverness. She is also very connected to her spiritual side and her Seneca heritage and culture. I was very excited when I found out that Perry was writing another Jane Whitefield book after nine years, and overall I was not disappointed. Jane was her usual awesome self, and my only complaint was that the pregnant young woman makes some really dumb mistakes and it is hard to feel sorry for her. The crazy grandparents are totally over-the-top, but they are unique and unexpected villains. If you are new to the series, you should have no problem following the story. 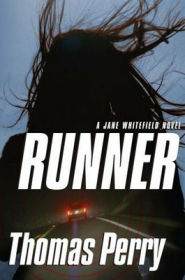 I think Jane Whitefield fans will be pleased with Runner because it’s a good addition to the series. Buy Runner by Thomas Perry on Amazon by clicking here .